PAVE® Technology Co was founded in 1980. Its wire and connector hermetic seals are used in a very wide range of industries for low or high pressures or vacuums requiring helium gas tight seals or IP67 to IP69 seals. PAVE products feed through a sealed bulkhead either electrical or fiber optic signals without any detectable leakage of gases or fluids. This complete leak tightness performance includes ends of any insulated, shielded or stranded copper conductor wire, cable and/or pins. “PAVE seals the quality in” for our customers by investing in employee training and advanced test and production equipment. PAVE Technology’s Quality Assurance procedures and testing are certified to ISO 9001:2008. In addition, PAVE has enhanced its quality procedures to be NQA-1 compliant. PAVE Technology is also approved by numerous major aerospace, automotive, R & D Laboratories and other industrial corporations as a key supplier meeting quality, cost, and delivery issues. Helium leak detection with sensitivity to 2 x 10-11 cc/s (air equivalent) can be done at 1 atmosphere to 2,500 psi (170 bar) pressure differential. High-pressure nitrogen bubble test or hydrostatic test fixtures from 90 psi (6 bar) to over 10k psi (700 bar) are also used to verify complete seal integrity, including cable end. Length of the test may vary from 30 seconds (typical) to several hours or cycles, depending upon cable lengths, pressure, etc. 100% leak testing or statistical control is used with zero defects the goal. 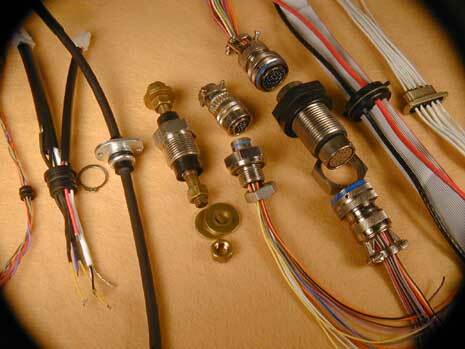 CAD is used to meld electrical and mechanical engineering into custom hermetic connectors for maximum design accuracy for our customers. AutoCAD® or 3D SolidWorks or IGS or pdf file formats can be exchanged via e-mail to more quickly produce new designs. Electrical testing using both DC and/or AC continuity and hypot testing is extensively used to assure electrical performance. Typical standards are up to 1,000 VDC with a minimum 500 megohm insulation resistance. Up to 30k VDC or 5k VAC hypot testing can be done. Where moisture or other conductive fluids may be present, the “wet” end of the PAVE-Seal housing with the wires bent over is tested immersed in a saltwater solution to assure long-term performance. Computerized harness testers provide maximum reliability and cost-effectiveness. Critical high vacuum components including hermetic PAVE-Seals can both be tested and vacuum degassed in the high vacuum chamber. It has vacuum capability to 10-6 Torr (mbar) with its cryopump and bake-out to 150° C.
Where applicable, PAVE-Seals® can be subjected to thermal cycling between -80° C to +200° C or thermal shock per military or commercial specifications prior to leak and electrical testing. Long-term seal and electrical integrity has been established over years of developing seal technology. This is based on past and current customer field experiences and their wide range of pressures, temperatures, and seal environments.